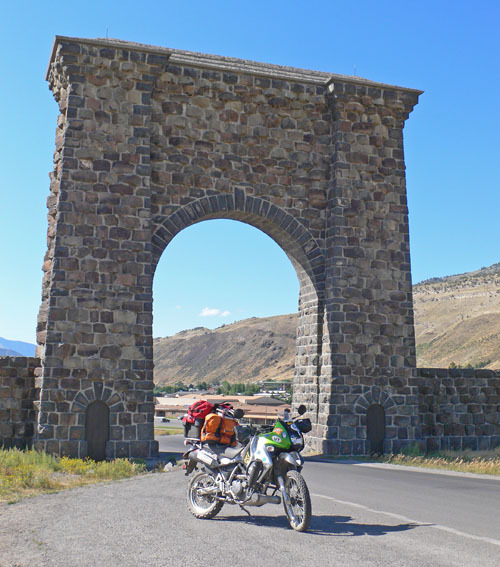 With summer finally arrived in the northern Rockies, I packed up my Kawasaki KLR650 dual-sport motorcycle for four mid-August days of exploring and camping in southwestern Montana. 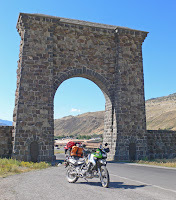 But to get there, I opted to ride through Yellowstone National Park in Wyoming, and visit the only dirt roads remaining in the park that are open to the public. The first is six-mile, one-way Blacktail Plateau Drive Auto Trail, which, as so many roads do, generally follows the course of an old trail that Native Americans used long ago. 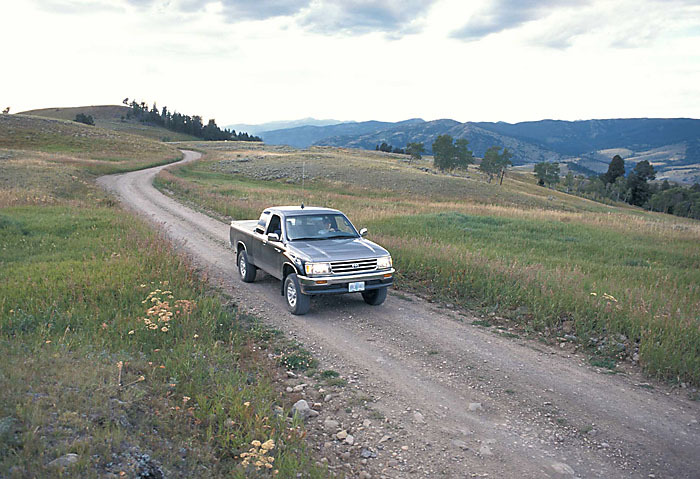 But as the name suggests, this single-lane 2WD high-clearance road climbs gently onto a plateau that offers sweeping vistas into the rugged wilderness of the Absaroka Range. 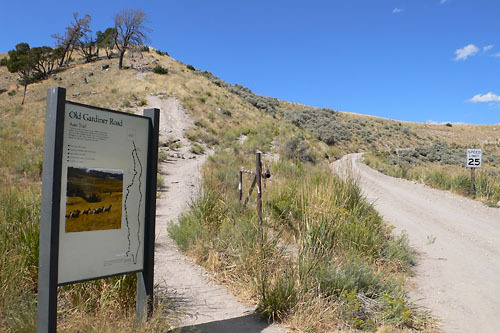 The second is Old Gardiner Road Auto Trail, a five-mile, one-way 1880s stagecoach road high above the canyon of the Gardiner River between Mammoth Hot Springs (park headquarters) and the town of Gardiner, Montana, near the park's north entrance. Old Gardiner Road also is a high-clearance, 2WD road. It begins behind Mammoth Hotel, and ends at the park entrance station not far from historic Roosevelt Arch. 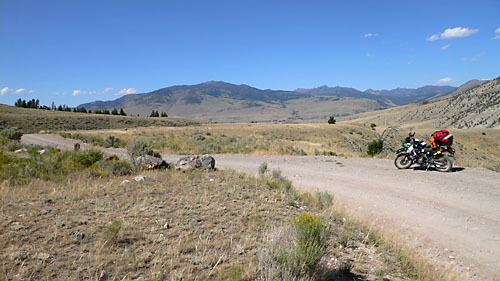 The road's views extend from Mammoth Hot Springs to the south down into the canyon of the Gardiner River, and north into the wilds of the Gallatin Range. 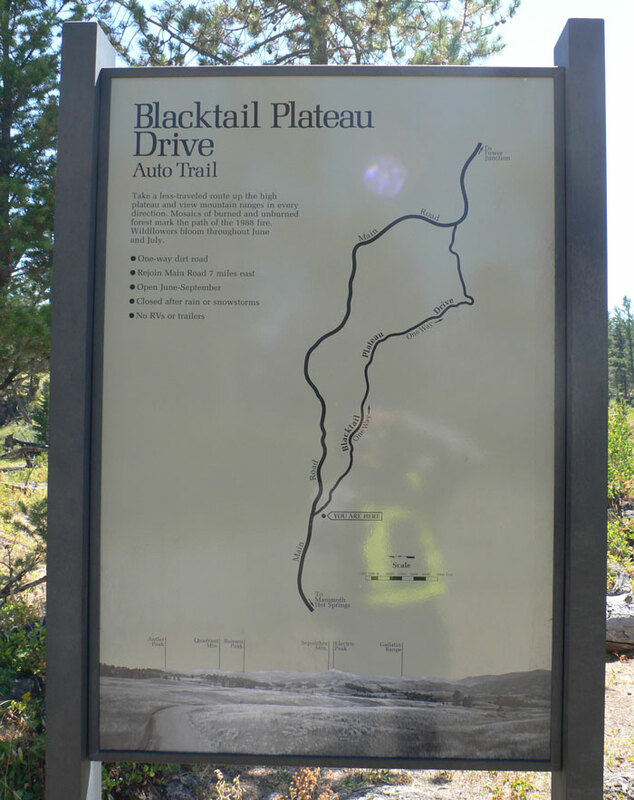 Blacktail Plateau Road is open June to September. It begins about 9.4 miles east of Mammoth Hot Springs, and about mid-way on the road between Mammoth and Tower Junction. Old Gardiner Road is open May to October. However, both are closed to vehicles after rain or snowstorms. In past years, I've driven Blacktail Plateau Road and had it to myself. This time, however, I was surprised by how much traffic there was, including passenger cars slowly making their way over loose roadbed rocks. I saw no one else on Old Gardiner Road, however. Busy or not, these are the only two dirt roads you can drive in Yellowstone. In an era when so many are traveling isolated from the natural landscape inside massive motor homes, these short roads enable motorized visitors to sample of how travel in park used to be -- and how it should be.